Realtor, Native Dallasite, Accredited Home Stager & Negotiator, REO Listing Agent, Former Nurse, Mother…I have seen it all. With 20+ years as a DFW Realtor I know how and where to find the perfect homes! My home buyers quickly find their dream home with their own access to the MLS. Everything I send from the MLS will be active. My home sellers will receive my honest detailed evaluation of your home's value and Proven marketing plan including strategies to stage your homes best qualities offering maximum exposure to find your perfect buyer in lightning fast time getting you the best price for your home! Would we work well together? I have three wonderfully amazing children that grew up going to PISD. I'm a Yogi wannabe, Techie, HGTV junkie and DIY nailed it hobbyist. Born in Sanger, raised in Richardson, living in Plano/Allen and family from here to Fort Worth. Working almost exclusively as a Foreclosure Listing agent during the down market of the mid 2000's I carried over 15 listings a month each with 20+ offers to be vetted and presented to the bank. That organization, quick calculations of repairs/remodeling costs, expansive contractor network and wearing my general contracting hat while preparing homes for resale continues still. As real estate specialist, I know what it takes to sell homes in any market. I bring expert knowledge, valuable experience blended with the latest technology, a well-defined marketing plan, a cohesive network, energy and enthusiasm. Get more information about selling a home in the DFW area on our Sellers Page. Continuing education from my accredited buyer representative designation, certified negotiation expert, military relocation, new home construction specialist to one of my favorites my Accredited Staging Professional. Since I strongly believe staged homes sell faster and for more money I provide this as a free service to my sellers. Plus I'm able to assist my buyers in spatially deciding what home fits their family's needs. See an example of some of our virtual tour marketing here. Staged homes sell faster and for more money! See some before and after photos here. FUll TIME AGENT why does this matter to you? See the differences here. Ensuring you exceptional service at every step of your home buying process. Checkout our Step 1 video! Search new home construction homes exclusively and get more information about Building in the DFW area. 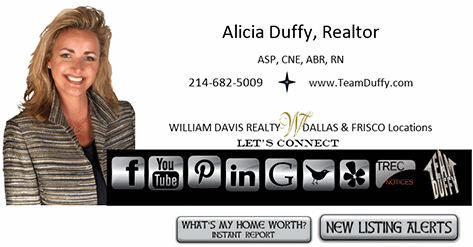 "I would highly recommend Alicia Duffy. She is a true professional and demonstrates a work ethic not routinely seen today. We felt very reassured ... more "
"My husband and I connected with Alicia for what would have been a relocation from NYC. She was familiar with different areas, gave suggestions about ... more "
"Alicia was great! We are first time home buyers and were super overwhelmed with the whole process in the beginning. We looked at a couple houses on ... more "
Better yet call me today for your Personal Consultation to help you develop the perfect timeline to make your move seamless whether it's in 1 month or 1 year. One call and done.